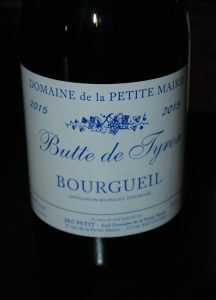 2015 Domaine de la Petite Mairie, Bourgueil Rouge “Butte de Tyron” Loire Valley, France. A new domaine to me, Domaine de la Petite Mairie, is owned and managed by Corinne and James Petit, an enthusiastic couple who passionately care for their vines in the Bourgueil region of France’s Loire Valley, making studied and elegant versions of Cabernet Franc, like this little beauty. James Petit, who took over for the retiring Jean Gambier, is a traditionalist in the cellar, his fermentations (in stainless on this cuvee) and macerations last for about 15 to 18 days, with the wines raised in a mixture of old oak “foudres” and smaller oak barrels, no new oak used here, just two reds and a rosé are produced at the domaine and all the wine is made exclusively from Cabernet Franc. The wonderfully delicate 2015 Bourgueil is very fine, in fact so elegant it almost made me feel like I was drinking a Burgundy with it’s graceful and ripe tannins, bright flavors and subtle floral perfume, it’s only after the second sip that you get the terroir driven Franc character with light earthiness and faint bell pepper spiciness showing, with a medium bodied palate gaining complexity and depth in the glass. This ruby/garnet hued wine really entertains and while restrained, it makes for a great drinking Franc that can only be from one place on earth, and it’s joyous with simple country cuisine. Layers of vibrant plum, dusty cherry and tangy currant fruits, a touch of chalky stones, cedar, crushed violets, peppery elements and a vein of fennel. This wine is charm from the start and is a great value, imported by Rosenthal Wine Merchant, this cuvee “Butte de Tyron” is made just the US market, this is a winery to look for, especially this unfined and unfiltered bottling. This wine quietly impresses and should drink well for many years to come, the year’s ripe fruit and structure will certainly reward those that have patience, best from 2018 to 2028.